What does it mean to be legitimate? To be counted in? To be one of us? My work explores tenuous moments of formation and definition. A maker has a say in ascribing an identity to its charge. With a word, I can deny belonging. Withholding a secret, I can pretend (authorize) a status. With a wish, I can envision outlandish possibilities. 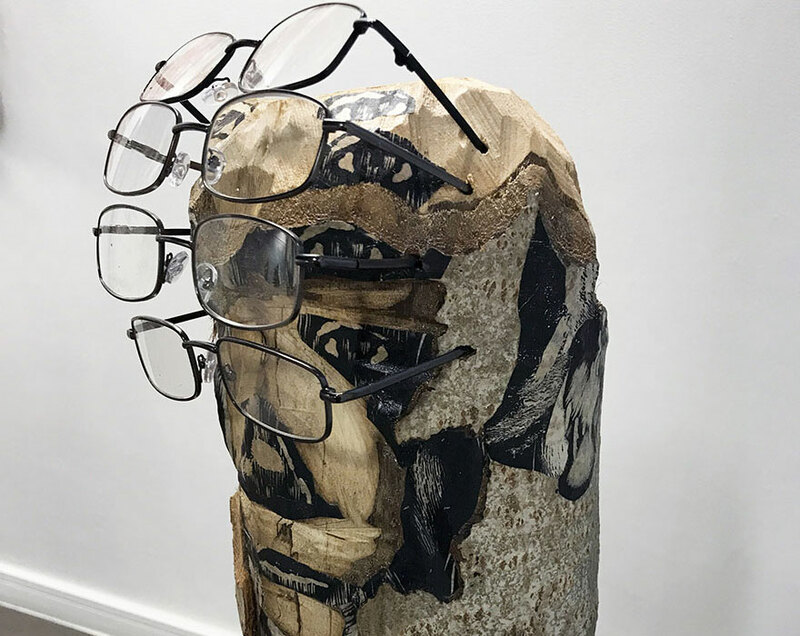 In my wooden sculptures, I adhere printed imagery to carved dimensional areas, while conversely allowing broad swaths of bark surface to remain intact and unmanipulated. In this way, I call attention to the process of emergence. Likewise, in my prints, I contrast hard-edged graphics against fluid, painterly passages. My figures exist in varying states of description—at times declared, at times nebulous, always waiting for final designation. Like Geppetto gazing at his puppet, I imagine these creations finding animate character. And in my mind, I wonder what tasks they must undertake to realize their sanctioned stations. Join us, Thursday, January 31, for our first Factory Mark Gallery opening of 2019, A Real Boy, featuring the work of artist Marc Cote. As a figurative expressionist, Cote uses personal biographical history intertwined with folk tales and fables, historical references, and a bit of religion to create complex narratives. RSVP to join us at the opening. Marc Cote is the Dean of Arts and Humanities at Framingham State University. He holds an MFA from the University of Connecticut and a BFA from the University of the Arts in Philadelphia. Marc serves on the Board of the Boston Printmakers. He has displayed his work in many local, national, and international venues, including The Kingston Gallery in Boston, The 13 Forest Gallery in Arlington, The International Print Center in New York, The Santa Cruz County Art Museum in California, and the Kyoto Woodprint Association in Japan. His prints are in numerous collections, including Harvard University, the Boston Public Library, the Danforth Museum, the Zuckerman Museum in GA, and McNeese State University in LA.